We must ensure that we create a global people's movement that will call for — FIGHT FOR – a 1ºC limit to global average temperature increase (a 2ºC "target" is global suicide). Why is a 1ºC limit vital for our survival? The Intergovernmental Panel on Climate Change (2007) says that at +1ºC, world food production is threatened. It has long been established that at +1ºC, food production in the global South will start to go into decline, leading to famines and mass migrations, thereby destabilizing world security. At +1ºC, the summer Arctic sea ice will be long gone, and the winter Arctic sea ice will be melting, resulting in a catastrophic acceleration in the increase of global temperature. At +1ºC, the already-thawing permafrost (which contains double all the carbon in the atmosphere) in the Arctic will be emitting very large amounts of methane (which has over 70 times the heating power of carbon dioxide). At +1ºC, frozen solid methane gas (hydrate) in the Arctic seabed will melt at a rapidly increasingly rate, emitting methane into the ocean and into the atmosphere. This will result in abrupt, unstoppable, totally catastrophic global heating. For all of humanity and for Mother Earth, we must fight with everything we have (time, skills, energy, passion, dedication, courage and social media networks) for a 1ºC limit. 1. DECLARE A GLOBAL CLIMATE CHANGE PLANETARY EMERGENCY. For nations to honour the terms of the 1992 United Nations Framework Convention on Climate Change, they must make a declaration that the world is far past dangerous interference with the climate, according to the clearly defined terms of the Convention. - the right to learn how to create the best possible future for themselves (growing their own food, constructing rainwater collection systems, exploring renewable and perpetual energy technologies, bonding with the rest of Nature). 3. PUBLICIZE, PUBLICIZE, PUBLICIZE - Adults who do not understand the basic science of global warming cannot understand that we are in a global climate change emergency. Yet where I live, most adults cannot explain to you the science of global warming and climate change. We have failed to pass on an understanding of the basic science to adults. While youth can (and must) receive lessons in school, adults must receive "lessons" through the media and NGO/social movement campaigns. EVERY CITIZEN has the right to understand the truth about what is happening. EVERY ADULT should be crying out to their government leaders "What are you doing to the beloved children in my life?!" If they are not, then we have failed in our efforts to communicate and publicize the deadly threats of global warming and climate chaos. The most important thing to publicize is the Bolivian climate change position, especially the limit (not a "target" to be strived for!) of a 1 degree Celsius global average temperature increase — and the reasons and rationale for it. THE SURVIVAL OF HUMANITY IS AT STAKE. PEOPLE AROUND THE WORLD MUST LEARN THIS, HEAR THIS (OVER AND OVER), AND TAKE IT TO HEART. 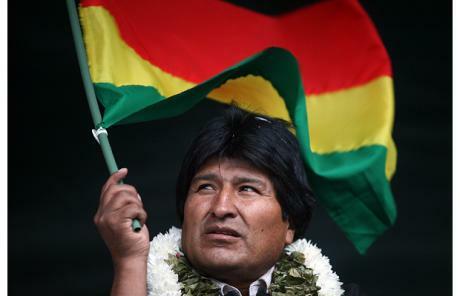 The Bolivian position is the only one that agrees with the science of global warming and climate change. 4. SOLUTIONS MUST NOW COME FROM THE PEOPLE. We can no longer trust governments, who are negotiating to avoid an agreement, not create one (they gave us this clear message in Copenhagen). We have no time left, if we are to guarantee a viable, climate-safe future for humanity. We are fighting for the lives of our children. From now on, we cannot trust any solutions proposed by wealthy nations who cannot see that fighting the good climate change fight is for the common good of all life on Earth (or who can only conceive solutions that will benefit themselves financially). From now on, we can only trust initiatives and solutions proposed by the PEOPLE who stand to lose everything -- their lives and their livelihoods, their food security and water sources, their homes and their entire homelands. If this means revolutionary measures, so be it. Certainly transformative measures are called for. But it might also mean slowing down, adopting some old traditional ways (as we also adopt en masse some new environmentally friendly technologies). We must, as rapidly as possible, transform our deadly fossil-fuelled global economy into thriving renewable/perpetual energy-based localized economies – making the world safer, cleaner, healthier, more equitable and more peaceful at the same time. 6. DEMAND TRANSFORMATIVE CHANGE. We must ask for what we need in order to survive the global climate change emergency: a +1ºC limit on global average temperature increases (not the deadly +2ºC "target" that has taken hold in negotiations and media reports), zero carbon and climate survival — the guarantee of a safe climate for our children. Let us start painting the picture of the transformative changes we need. Until we start dreaming big, envisioning big, asking big, demanding big, we are not going to get the big changes – the complete conversion – that we need. 7. ZERO CARBON, ZERO CARBON, ZERO CARBON – Over the last 100 years, and especially since World War 2, we have been gorging ourselves on carbon-based energy. Industrialized nations have pushed atmospheric carbon levels to the highest level they have been in 20 million years. Zero carbon technology, a zero carbon economy and virtually zero carbon lifestyles must be our goal. Anything more than zero carbon condemns our children to a future of climate hell, and threatens extinction of most life on Earth. Let us ask our friends, neighbours and relatives to envision a world lit and run by the power of the sun (photovoltaics and solar thermal), the wind, the Earth's core heat (geothermal), the tides and the waves – all the perpetual energy sources. 8. LET US STOP WORSHIPPING UNSHARED WEALTH AND START SCORNING IT. This is a simple change of mindset. We have turned personal profit, greed and usury into virtues. Let us turn them back into sins. Wealth should be a shared community asset. Let us learn from our indigenous brothers and sisters, several of whom had traditional rituals and ceremonies for the sharing of wealth. 9. COMPASSION, COMPASSION, COMPASSION – If we hold the children in our hearts, we can safeguard the future and save humanity and life on Earth. If we allow our governments and the corporations to put money first — "business as usual" — then we will fail. Compassion can be what saves us. a. We must network with all the world's religions and spiritual traditions, as they are already walking the path of compassion — and already starting to work on climate change solutions. b. We must all see ourselves as educators about the truth of the dangers of climate change. c. We must see ourselves as protectors of the rights of all future generations. d. We must be courageous and willing to make sacrifices for the sake of our children — as so many generations did before us. e. We must green the heart of people, communities, governments and organizations everywhere.